Work accident statistics suggest that work-related illnesses and injuries are some of the most serious health and safety problems facing the United Kingdom today. According to the Health and Safety Executive, over 1.3 million people suffered from a work-related illness or injury in 2016 with an estimated cost of £14.1 billion. Suffering from a work-related injury or illness can be traumatic for even the most capable individuals, especially if the injury was not your fault. If you suffered your injury through the fault of your employer, then you could be eligible to make a work accident claim and receive compensation. If you think this may apply to you, please read on to understand everything you will need in order to make a work accident claim against your employer. A guide to making a personal injury claim against employer. 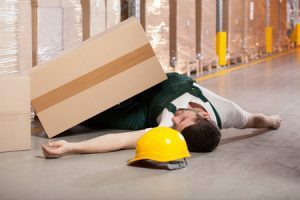 What is a Injury Claims Against Employer? Claiming compensation for an accident that was the fault of your employer. What to do next if you decide to make personal injury claims against employer. Common injuries sustained at work. Judging the severity of an injury caused by your employer. How to begin personal injury claims against employer. What can be claimed for against your employer? How much compensation will I get from my employer? An employer claim case study. No win, no fee work accident claims. Why choose us as your claims service to make personal injury claims against employer? This comprehensive guide will provide you with information about your work accident claim against your employer, detailing the steps you will need to take and advising you about how your claim could proceed. It will provide you with important and relevant information, such as how much compensation you could receive for your claim, how to begin the process of making your work accident claim against your employer, and why you should use our company as your Claims Service to support you throughout this process. be able to make a work accident claim against your employer if they can be considered responsible for your injury. For example, if you slip and fall whilst walking on an uneven pavement, you could make a personal injury claim against the council for any injury that you have suffered as result. The council are responsible for maintaining the pavement and would therefore be responsible for your injury. Potentially, they would be liable for your compensation. However, if you slip and fall whilst at work in an office — perhaps due to a lack of signage warning you of any risks – then you could make a work accident claim. In this situation, the accident may have happened through the fault of your employer. This makes your employer potentially responsible for your accident and potentially liable for the payment of compensation for the injury you suffered. If you are considering making a work accident claim against your employer, your ability to claim compensation for your accident is intrinsically linked to the concept of negligence. While the amount of compensation that you could receive as the result of your claim depends heavily on the severity and the type of your injury, whether your claim can be considered legitimate depends on how responsible your employer was for your accident. This, in turn, depends on whether the employer acted in a negligent manner. For your employer to have acted in a negligent manner, they must have failed to adhere to health and safety standards. The Health and Safety Executive, a government organisation in charge of such matters, states that negligence most commonly occurs as the result of employers not ensuring their employees are competent to complete the job that has been set. To see how this would work in a practical sense, consider a plumber working for a large plumbing company. If they are involved in an accident – such as a burn from a heating pipe – and that accident occurred as the result of them not receiving the correct training from the company, then the employer may be held responsible. However, work accident claims are not inherently tied to your individual competence. According to the Advisory, Conciliation and Arbitration Service, your employer has a duty of care towards you as an employee. This duty of care covers measures such as completing risk assessments of your task, providing training to complete tasks, and clearly defining the limits of your job. If your employer has failed in any of these responsibilities (or if they have failed in another, related manner), then they could be considered responsible for any accident that occurs as a result. If you have been involved in an accident at work which you consider to be the responsibility of your employer, you should ensure that you can make a work accident claim. If more than three years have passed since your accident, you could be in breach of the accident at work claim time limit and thereby not eligible to claim compensation. You will need evidence that supports your claim that the accident happened in the first place. The most common evidence that people use to support this is the record of the accident made in the Accident Report Book supplied by the Health and Safety Executive. However, if you made no record of the accident, you could potentially use witness testimony from others or even CCTV footage if you are able to access it. You will need to find evidence that your employer was responsible for the accident in question. This evidence could take a number of different forms. For example, you could cite an ignorance of health and safety standards or highlight how you were improperly trained. Once you have gathered together this evidence, you can begin to lay the foundations for your claim. The most common injury sustained at work – particularly when doing manual labour – is slipping or falling. This could easily result in a long term injury to your back, hip, leg, or even brain, depending on the severity of the fall. The second most common injury sustained at work – particularly as the result of working in a vehicle – is a vehicle crash and collision. Such accidents are particularly dangerous and can easily result in long-term damage to your body or even death. Another common injury sustained at work – particularly in office work – is repetitive strain injury and other muscle-related disorders. Through a possible lack of movement and poor posture, working in an office long-term could result in you developing a muscle-related disorder that causes you considerable pain and discomfort. Work-related injuries can be diverse. There are so many different types of injuries, that discussing such an injury with a solicitor might be the best way in which to establish whether you have a claim. If you decide to make a work accident claim against your employer, you will quickly learn that your compensation directly correlates to the severity and type of injury that you have suffered. This is due to the weighting of an accident at work claim calculator, which heavily emphasises the severity of an injury when judging potential payout amounts. Injuries classed as minor may include fractured wrists and muscle damage as the result of a repetitive strain injury. While these injuries do affect your health, they are not considered to be traumatic and tend to heal without major medical assistance. As such, minor injuries typically have the smallest compensation amounts. Injuries classed as moderate may include neck pain and even partial nerve damage to your limbs. Moderate injuries are typically longer-term than minor injuries, which leads to a larger compensation payout. However, moderate injuries can still be helped without complex or dangerous surgery and, as such, do not have the largest compensation amounts. Injuries classed as severe may include paralysis from a back injury or loss of brain function due to trauma. Severe injuries have a major traumatic effect, potentially causing permanent damage. As such, severe injuries result in the largest compensation amounts. As we will see below, the difference between minor, moderate, and severe injuries can be very important when it comes to calculating the final settlement total. As previously stated in this guide, the first step should be to gather the evidence needed to support your work accident claim. This evidence could include things such as a record of the accident in the Accident Report Book or medical reports detailing the incident and the injury you sustained as a result. However, after you have ensured that you have as much evidence as you can possibly gather, you will need to get into contact with a Claims Service. When you begin a work accident claim, it is essential that you receive the support of a legal professional to ensure that you have the best chance of successfully receiving the compensation that you deserve. If you choose to contact our company, for instance, your claim can be taken forward in an efficient, expert manner. After getting in touch with us, we can arrange a free consultancy session. In this consultation, we will assess how valid we believe your compensation claim to be and honestly evaluate its chances of being successful, based on the evidence you provide to us, our previous case history, and our knowledge of the law. After this session, if you choose us as your Claims Service, we can proceed with your work accident claim. We will provide you comprehensive support by completing further evidence gathering and can even arrange a local medical assessment to assess the severity of your injury. From this point onwards, we can handle the vast majority of the work while you focus on recovering from your injury. When you begin your work accident claim, one of the main focuses of your attention might be worrying about your compensation. Specifically, what you can claim for as compensation. General damages – including unspecified damages such as emotional suffering as a result of the injury, any effects that long-term pain has upon your life, and even any loss of professional reputation stemming from the injury or the medical treatment of the injury. Special damages – including measurable damages such as direct loss of earnings, the cost of home-care required by your injury, and damage to your property such as your vehicle, if you were involved in a vehicular accident. Medical costs – including the cost of medical tests and treatments either not covered by the NHS or sought from either private healthcare providers or overseas healthcare providers. While it is important to acknowledge the limits of what you can claim as part of your compensation, another important aspect of your work accident claim that you need to consider is how much compensation you could receive from your employer. If you are wondering how much compensation you could receive from your employer, then you should first be aware of how much compensation can vary, depending on the circumstances of individual cases. However, the compensation you could receive generally depends on the type and severity of any injury or illness. These averages should provide you with a general understanding of how much compensation you could receive and demonstrate why establishing the severity of your injury is so important to your claim. However, it should be noted that these are simply averages and the amount of compensation you could receive as a result of your claim may be very different. Considering the complicated and varied nature of work accident claims, raw statistics might appear detached from your personal experience. However, you may be convinced by the real case study of an individual who experienced the process of a work accident claim. In 2016, the claimant slipped down a flight of stairs at their workplace. The stairs were deemed to be improperly maintained. The accident occurred after the claimant made a previous complaint about the maintenance of the staircase, with little reaction from their employer. The accident resulted in a major knee and back injury, requiring extensive surgery and physiotherapy over a number of years. With the support of a Claims Service, the claimant made a knee and back injury at work claim and received a total of £275,000 from their employer directly as result of the severity of their injury and necessary treatment. Though only an individual example, this should provide you with a basic idea of how your work accident claim could progress, as well as highlighting the most important aspects of your claim to consider. One of the most common challenges that could arise from your work accident claim is the issue of legal costs. Your Claims Service could potentially charge you extortionate fees that damage your finances during a period in which you need as much stability as possible. However, our company will do our best to minimise your hardship during the claims process. If you choose our company to represent you, our ‘No Win No Fee’ Policy can provide you with financial stability throughout the claims process. This policy – also called a ‘Conditional Fee Agreement’ – is an assurance that our company will do its best to win your case and get you the compensation that you deserve. We promise to only charge for our services on the condition that we win your work accident claim; if your claim fails, we will not charge you legal fees for the work we have done. If you decide to make a work accident claim against your employer, you will need the support of a Claims Service. We believe that you should choose us as your Claims Service and let us provide you with the stable support that we know we can provide. Our years of experience in dealing with work accident claims places us as one of the most capable companies for dealing with claims against your employer. This experience has enabled us to gain an excellent understanding of work accident claims and how to heighten the chance of your claim succeeding in court. Our team can advise you as to the best course of action throughout the entire claims process. With our free consultation, ‘No Win No Fee’ arrangement, outstanding customer service, and even our ability to arrange special medical appointments for you, we are the ideal law firm for your claim. You can begin the process of your claim with the contact form on our website or by calling 0800 073 8804 now. Our company is ready to provide you with premium advice and assistance regarding your claim.